Eva Rolle is a former boxing promoter in Germany, has organised more than one hundred boxing events worldwide and is very highly regarded within the industry itself. In the past she has worked with the likes of Don King, and is famously known as the woman in red. She now works at the Legends Boxing Foundation as the president’s advisor. Eva has been kind enough to share with us her compelling story and where she wishes to take female boxing in the next decade. WV: How and why did you become involved in boxing? My interest in boxing started very early. Since I was a little girl I was watching the fights of Ali, together with my grandfather. I always had a passion for this sport. But, in the past female boxing was not popular like it is today, so I had to fight my fights outside of the ring. I stepped into the business as my youngest son began boxing training twenty years ago. I did not like the boxing gyms in Berlin, so I decided to make my own one. WV: Who are your favourite fighters of all time? My favourite fighters were Muhammed Ali and Rocky Marciano. I think we have had a lot of strong and good boxers, but these two boxers were also champions outside of the ring. There character is very important, as they are also role models. In addition, Katie Taylor is not a prospect anymore, but with her amateur background and with the trainers she has, she for sure will dominate for years. The same class as Claressa Shields. A real prospect is Evnika Sadvakasova, but we need to wait some years for her to develop. WV: Do you feel as if ladies boxing should be on prime-time TV as well? Should they have pay per view events? And, furthermore should they be paid as much as men? We need the television and their courage to bring female boxing into the spotlight. We are getting more and more good quality female fighters. Now we must give them a chance. With good fights the interest female boxing will grow and grow. Also, a tournament supported by TV networks would bring the girls to the focus. They deserve our support. But, first we need to work on the basics. With more female boxing on the television, the interest will grow and then we can think about pay per view, and the higher purses. Step by step. WV: So, could you tell us about the history of the “Boxing Legends Foundation”, your role within the company, who they are in the sport today, and where you expect them to be in five years’ time? Legends Boxing Foundation is an idea to make the business of a sanctioning body more transparent and fair for the boxers and spectators. We also support the boxers, and not only the promoters. I am the advisor for the LBF president. We will see what happens in the next five years. But, we do not sell our soul for the business. And if it takes ten years to bring the LBF up, we will still have time. WV: As a matchmaker and promoter could you tell us of any fighters you have worked with? And to make it interesting do you have any stories which stand out in your mind? I can tell you all boxers are crazy. Most of them are lovely, but they are not like normal people that is for sure. Its funny what kind of stories I have heard, and what kind of excuses even before the fight begins with a request of an easy fight. Of course, we never arranged or fake a fight, but also as a matchmaker sometimes you will hear, that they need an easy opponent, and I need to win. However, there are some boxers that don’t even know who their opponent will be, for example some journeymen. Once a motorcycle gang came to one of our shows to support a fight. They were sitting in the front row and were not behaving as gentlemen. I went over to the boxer, whom they were supporting, and told them if they do not behave he can leave with them, as it was my event. They then behaved accordingly. 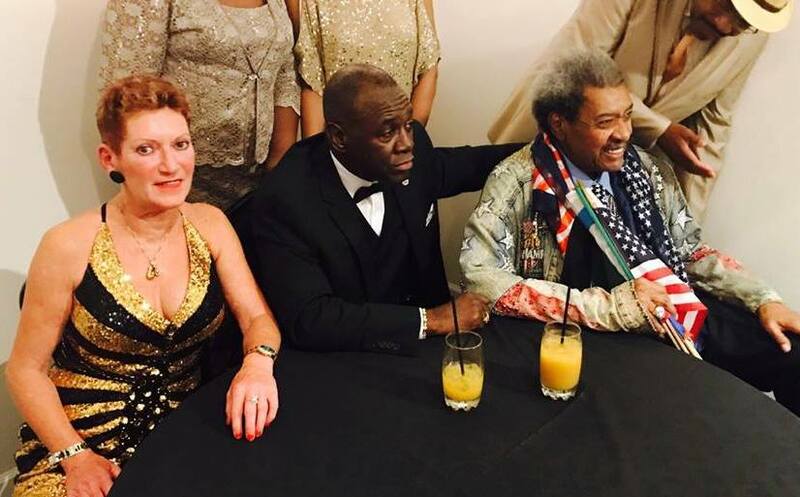 WV: Were you affiliated with Don King in the past? What was he like to work with? And what is he like as a man? Any legendary stories would be much appreciated. WV: Your son was a professional fighter. Who was he? And what was his professional record? My son Robert Rolle was the German champion and European champion for the IBF. He had an eye injury, and his career really stopped before it got started. Now, he is a very good boxing trainer, and we are all happy with the way things have worked out. WV: What do you do in boxing which involves children? And furthermore, do you think boxing should be on the national curriculum in schools? We had a project called “Doppeldeckung” in Germany and we helped the kids from the streets with their problems and tried to get them back on the straight and narrow, and get them into education again. The problem was that we all pay for ourselves, and we don’t get any support from the government. Boxing is the perfect sport to train the body and the soul.So, it will be a great idea with the right trainers and the right attitude. I don´t want to see kids punishing other kids in school for fun, but to learn respect and build up self-confidence, and boxing is the perfect tool. WV: How did you go about bringing female boxing into the IBF? WV: Any further comments you would like to add or tell the audience? I would like to thank all the spectators and fans for the support of our beautifulsport which is boxing. I wish for the respectful treatmenttowards all boxers. The champions, the contenders and with the journeymen all deserve our respect to the pros and the amateurs. With the male and female fighters. They all go inside the ring and risk their health to entertain us. Please never forget they all deserve our respect.